The Guludo team really have outdone themselves! 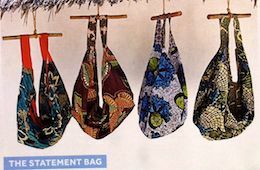 Last year Caitlin, Angus, Harry and Assane started working with local tailors to produce bags that could be sold to Guludo guests and both provide livelihoods for local tailors and provide an income for Nema Foundation. The result has been a stunning array of bags that have been so popular we have started selling them online through Global Angels and they have even made it into the Prestigious Sunday Time Magazine HOT LIST!